We visit the Saint Paul Farmer’s Market every weekend that we’re in town. 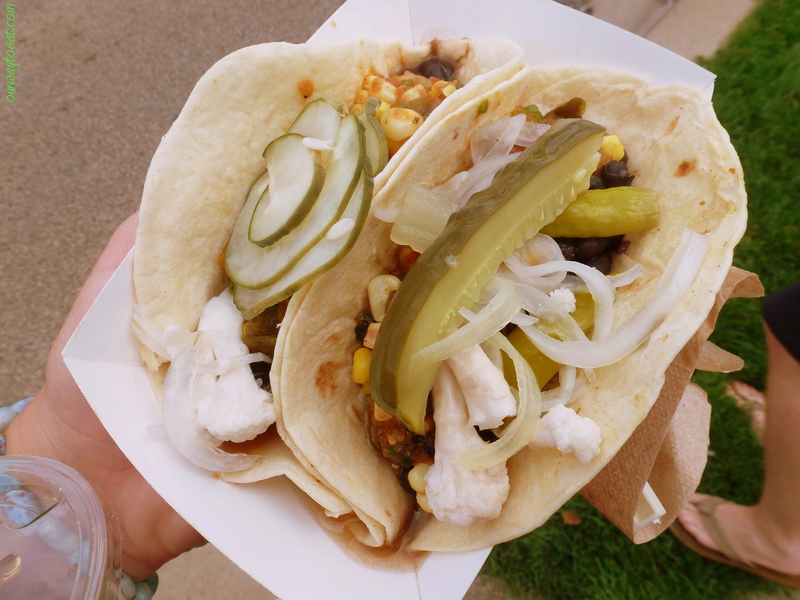 We had friends visiting from out of town last weekend, and so we decided to change up the routine and venture out to the Mill City Farmer’s Market to check out a different market and sample a much-buzzed Twin Cities Food Truck that parks there on Saturday mornings. We weren’t surprised to find that the Mill City Farmer’s Market is a great place for crowd watching, beautiful produce and good eats. 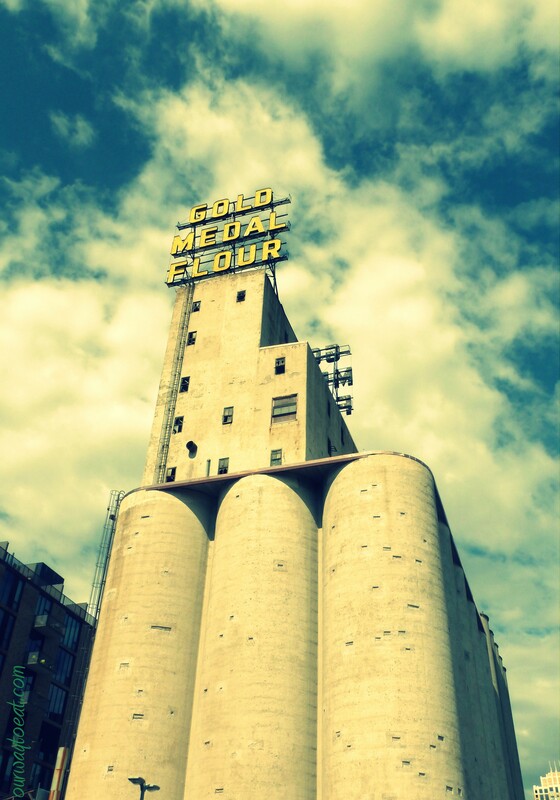 The Mill City Farmer’s Market is tucked between the Guthrie Theater, the Mill City Museum, and the Gold Medal Flour elevator and the condominium building that houses Spoonriver, my favorite restaurant in Minneapolis. The Mill District and nearby Saint Anthony Main, which is directly across the wonderful pedestrian-only Stone Arch Bridge over the Mississippi are two of the most fun pockets of Minneapolis to stroll through. I love their lively atmosphere and unique architecture which reflect the area’s evolution over time from a riverfront industrial district to the cultural center of the city. Even though I love visiting these places, this was our first trip the Mill City Farmer’s Market. Although the vegetable stands were overflowing with organic veggies, it is much more than just a place to stock up on heirloom tomatoes. People gather, music is played, there are artisanal cheeses, chocolate and baked goods, handmade clothing, furniture and other art for sale. The space was packed to the gills by mid-morning with strollers, camera-wielding bloggers, Iphone-ing instagrammers, gawkers, some shoppers and people like us who are there to eat. 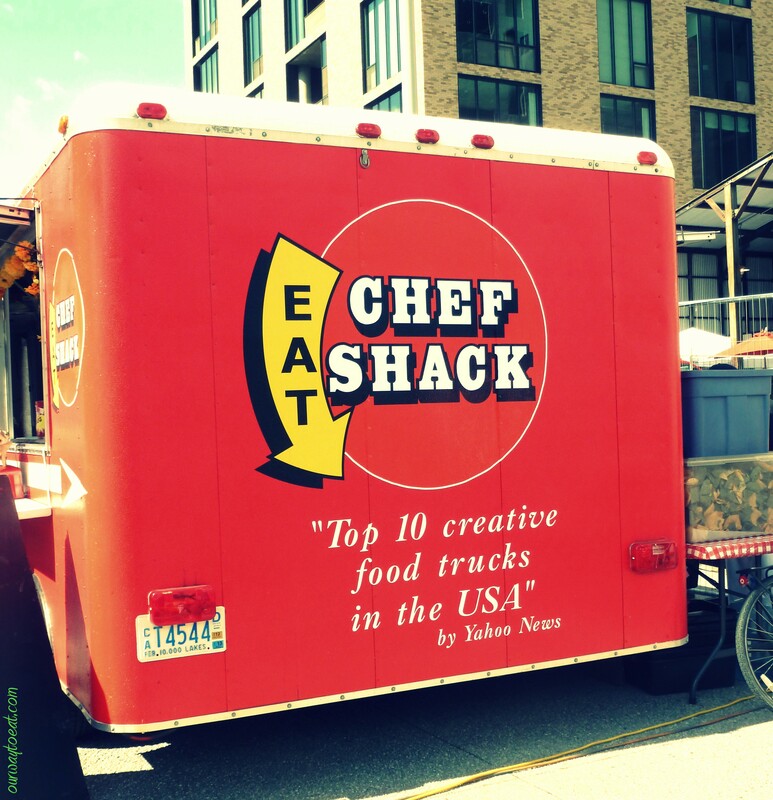 Once we toured the market, we joined the lengthy line at the Chef Shack food truck. The line moved quickly. It gave us just enough time to peruse the chalkboard menu. Bjorn ordered a Walleye Sandwich and a bag of the Chef Shack’s renowned Indian-Spiced Mini Doughnuts for the group to share for dessert. 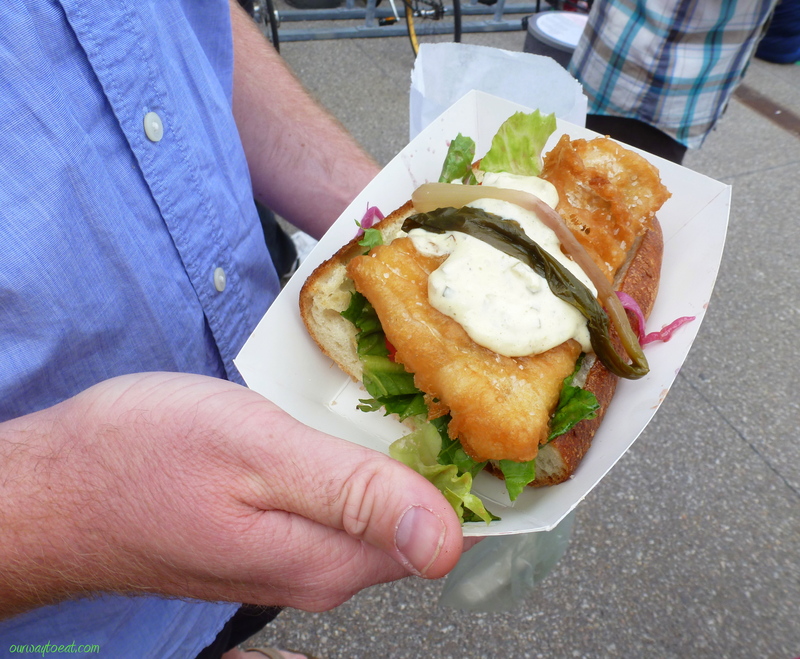 As you can see, the sandwich consists of a meaty walleye fillet, fried crispy and served on a fresh baguette with lettuce, tartar sauce and veggie trimmings. Bjorn confirmed that the sandwich was one of the best he’s had. The four of us devoured the mini doughnuts so fast that I couldn’t even take a picture. I swung by the Spoonriver food stand and purchased a refreshing glass of unsweetened Mango Iced Tea. 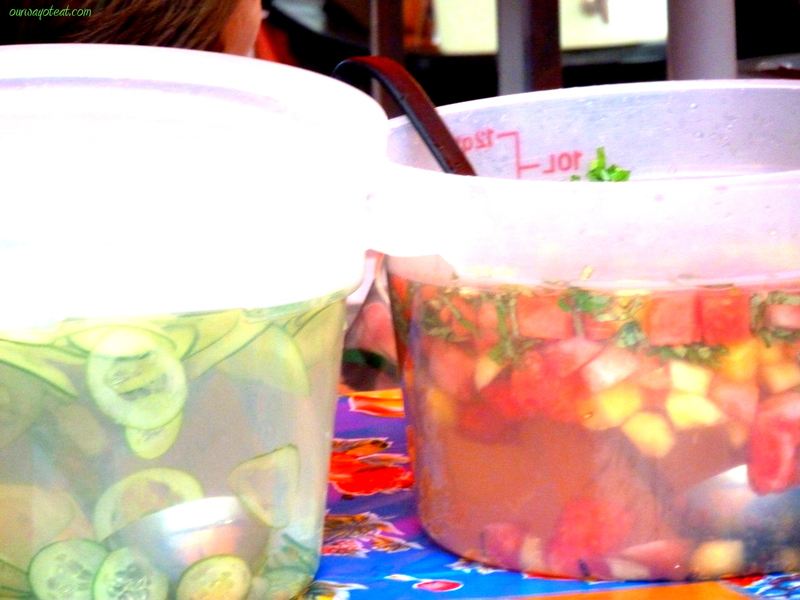 Their Cucumber Water and Watermelon-Basil water were also beautiful and looked refreshing. It was very tempting to try a savory Spoonriver crepe, but I wanted to stick to the Food Truck option for today. I was the sole vegetarian in the group. 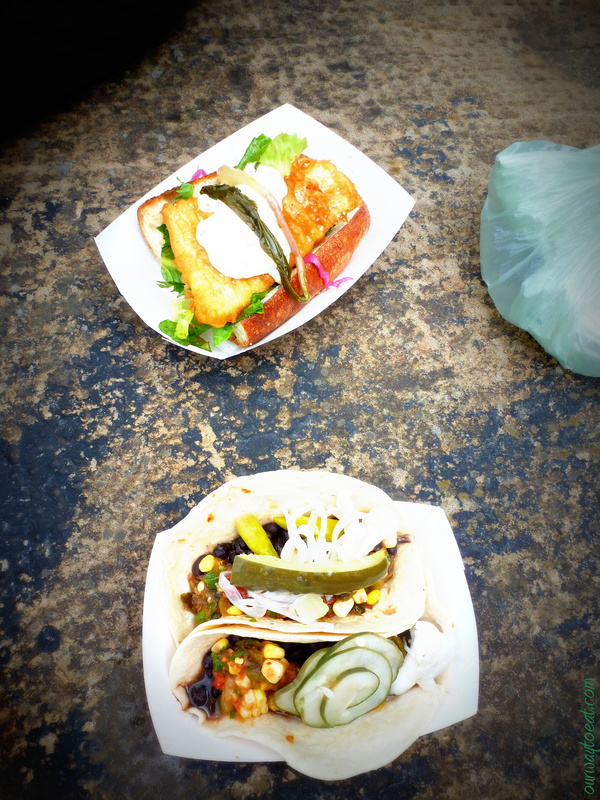 I ordered the Sweet Potato Tacos, one of several vegetarian offerings from the Chef Shack. They were tasty. I piled on some of the house-made garnishes available in tubs: pickly cukes and cauliflower, a dill pickle and some slaw. I am a sucker for garnishes. The double-layered tortillas were extremely fresh and delicious. 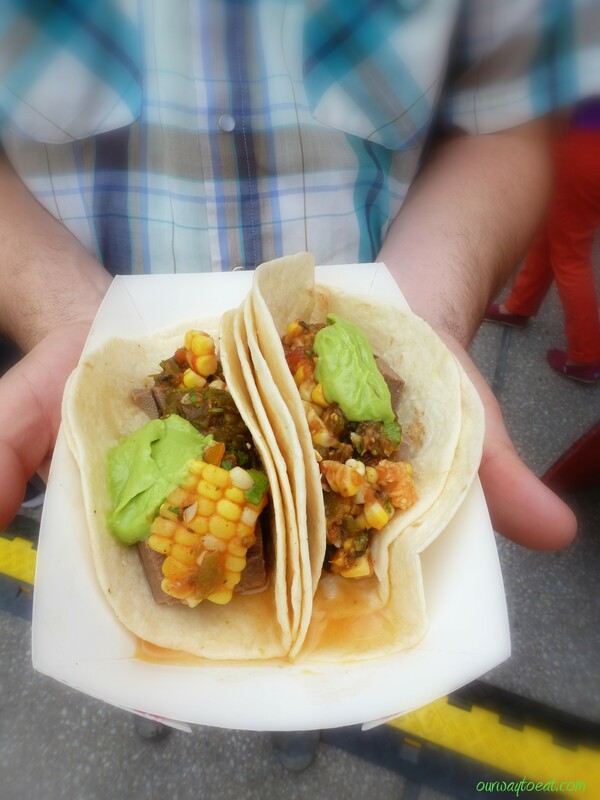 I was glad to have the second tortilla layer, because the bean-corn-sweet potato mixture in the tacos was on the watery side, though wonderfully flavorful. The tortilla kept it all contained. I crumbled a little fresh feta from Singing Hills Dairy, purchased in the market on top–I won’t lie, I do prefer veggie tacos with cheese. 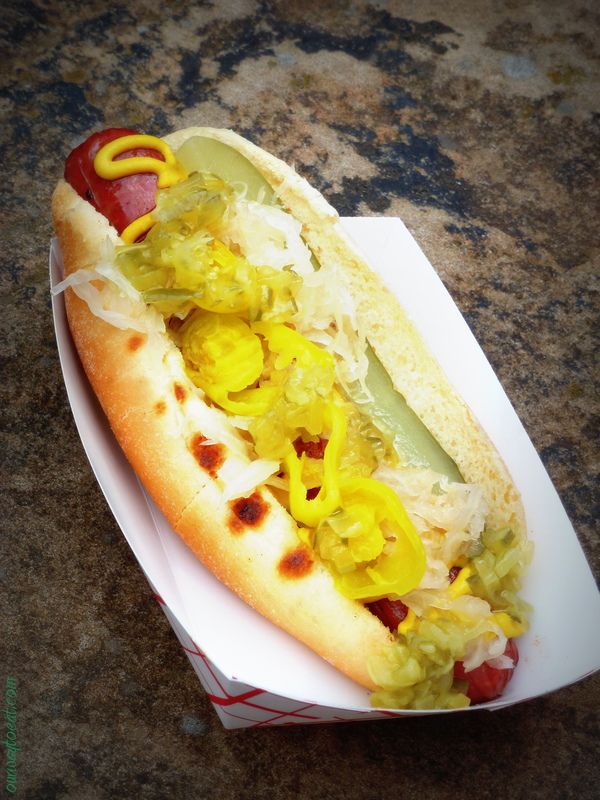 Our friend Jenny ordered a grass-fed, all-beef hotdog and also piled on the house-made condiments and garnishes. One of the Chef Shack chefs greeted us at the condiment table, and asked us cheerfully if we found what we needed. Yes, we certainly did. We walked away from the market, plopped down on a flat rock that served as our seating and table and enjoyed a wonderful, unique and tasty lunch. I’ve visited a handful of food trucks in Minneapolis and Saint Paul and this was by far the best food truck meal I’ve experienced to date. This is the sort of truck that justifies its existence. The food simple, inspired and is as good or better and more fresh than many restaurants, served casually, quickly and is perfect for outdoor eating on the go. If you find yourself in Minneapolis on a Saturday between the hours of 8 and 1, I highly recommend a trip to the Mill City Farmer’s Market followed by a delicious lunch from the Chef Shack. Delish! This entry was posted in Adventurous Eating, Dining Out, Farmer's Market, Lunch, Omnivore, Summer, Vegetarian and tagged Beef Tongue Taco, Chef Shack, Fixings, Fruit Water, Gold Medal Flour, Grassfed All-Beef Hotdog, Guthrie Theater, Mango Ice Tea, Mill City Farmer's Market, Mill District, offal, Saturday, Spoonriver, Stonearch Bridge, Sweet Potato Tacos, Walleye Sandwich by Our Way to Eat. Bookmark the permalink. Isn’t it such a rich and interesting little niche? I love it. Hey, Awesome! We ran into the chef shack yesterday at the Kingfield Farmers Market, I had the bacon brat, totally delish. My husband, Jeff had the sweet potato taco’s, he wasn’t very impressed. We’ve had the Chef Shack before though, normally always super good! I was kind of over foodtrucks until we made it to this one. Now I’m back on the bandwagon. I’ve never been to the Kingfield Farmer’s Market either…I’ll have to check it out some time. It was good to get out of the same-old same-old in Saint Paul.